For a brief time in college, I wanted to be a music therapist. I don’t remember much (does anyone else feel like when you shove a ton of new information into your head, it kind of pushes a lot of the old stuff out? ), but something about exposure to music early in life is supposed to boost one’s immune system and reduce cortisol levels. Can anyone validate this? So I’ve tried, when I’ve remembered, to be a little intentional about music exposure during pregnancy…definitely not discriminating by any means, but also making sure to give way to musical cravings. In the last several months, I’ve listened to an embarrassing amount of teenybopper, bubble gum pop and a decent dose of bluegrass but, especially at night, I’ve really wanted comfort. During pregnancy, I was all about Rachmaninoff’s Vespers. Since Aurelia’s birth, I’ve taken to playing Eric Whitacre when I’ve had to set her her down and–this is kind of bizarre–singing “With You” from Pippin when I’m changing her and she’s going ballistic (all this time John and I mocked mercilessly the concept of the “diaper wipe warmer” and the parents who purchase them…there might just be some method to their madness). On that note, how cool is this? Love everything about the Virtual Choir! Thank you so much for posting that link! Ironically, I’m reading this right after I got up from the piano (Beethoven is the only artist I remember). But as far as classical music is concerned, I’m partial to Chopin’s nocturnes (my favorite: http://www.youtube.com/watch?v=5ZUw78FXpG4) and Franz Liszt (http://www.youtube.com/watch?v=KpOtuoHL45Y) and of course, Debussy. Absolutely everything by Debussy. Hi there! I always appreciate your suggestions, thank you! I could not agree more with your choices (DEFINITELY everything by Debussy)…and you’re reminding me that I should branch out a bit more now 🙂 It’s amazing that you’re keeping up with the piano while in school–go you! And SO cool that you considered art therapy–love it! Thanks so much for your comment! Glad to have you back. I like to read your blogs right in the middle of workdays when I’m hunckered down in the middle of a spreadsheet. Can’t do music though. How does A feel about cello music? Oh, I’m glad the blog provides a decent break! Sorry about the music, though–that’s a bummer! A is LOVING Jacqueline du Pre and Yo-Yo Ma! Anna, you know how I have always cheered you on in this pregnancy? So you know that I don’t yell at people about how they’re doing things, right? 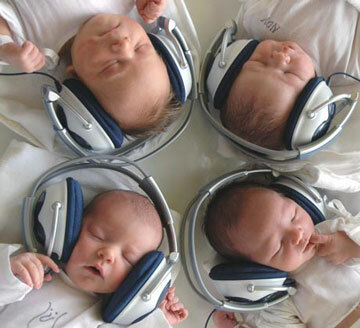 I don’t know if it’s okay for babies to use earphones. You would know better than I, no doubt, but it’s possible that you haven’t thought about it. Is it okay for them to have even soft sounds targeted so directly at their little ears? Does it do anything weird to the way their brains are figuring out how to process sound? This may sound uneducated. So be it. I just wonder if it’s okay. And if it is, feel free to give me a huge raspberry in my own ear. I’m just asking. I send a big smile to all of you, because I don’t know you well enough to send hugs. I bet Aurelia is even more adorable in person than she is via teh intarwebz! Oh, wait—that isn’t Aurelia in the pic, is it? So I don’t even know if you’re doing the headset thing. Never mind. Hi there! GREAT questions! I’m embarrassed that I never considered it. We actually don’t even have earphones like that, I just thought the picture was adorable 🙂 Despite whatever medical evidence might show, my first inclination is that I would be uncomfortable placing earphones on Aurelia…I’m not sure what the implications might be. We just listen to music in the background 🙂 Thank you for your input, it’s always welcome! How do you pronounce Aurelia’s first name, btw? Your last name is pronounced in Spanish, right? It seems funny to see the first name “John” with a Spanish last name. I pronounced it JEEzus in my head until I heard the radio thing about his book. Then I went ohhhhhhh and hit my forehead! Haha…well, maybe if you actually said something offensive 🙂 Respectful concern does not offend me though. Thanks for your comments! Have you seen the Movie *Love Actually*? The Portuguese woman is named Aurelia…I wish I remembered anything from phonetics class to be able to do better than: OR-RAY-LEE-AH–all very open vowels. We just say JEEzus, like you, because it’s Portuguese and pretty difficult to pronounce. If people prefer to pronounce it as though it were Spanish, that’s fine, but John has the same reaction as you, since his first name is anglicized. In the ED, he just goes by John so as not to anger any schizophrenics. Thanks for asking! Awesome vids. Caleb adds: Hans Zimmer did something like this for “The Dark Night Rises” to simulate a city full of people chanting – might not be the best choice for Aurelia Carmela. Oooh, I love it! Maybe not the best for AC, but the best for me!! !